In April 1921 David Lloyd George appointed Frederick Guest as Secretary of State for Air. During his eighteen months in office he played “a minor part in the desperate struggle to maintain the air force's institutional independence in the face of hostile attacks from the War Office and the Admiralty”. More importantly in the long term he was also responsible for the appointment of Sir Sefton Brancker to develop civil aviation. 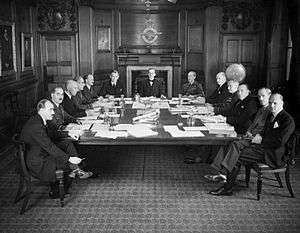 With the fall of Lloyd George in October 1922 Sir Samuel Hoare became the Secretary of State for Air. He was the first Secretary to have a seat in the Cabinet (Churchill had been in the Cabinet as Secretary for War as well as for Air), and remained in the post until January 1924, when a Labour government took power and Lord Thomson was made Secretary of State for Air. A supporter of airships, Thomson was responsible for the Imperial Airship Scheme, which involved the construction of R101 at the Royal Airship Works at Cardington. An early priority for Sir Hugh Trenchard, Chief of the Air Staff 1919-1930, was to establish the officer cadet training college at Cranwell as a permanent establishment. It was Hoare's job to negotiate with the Treasury for the necessary funds. After much resistance Hoare managed to include a provision for permanent buildings in his estimates for 1929. The foundation stone of the Royal Air Force College Cranwell was laid in 1929 and formally opened in 1934. By April 1944, the ministry's air Intelligence branch had succeeded in its intelligence efforts regarding "the beams, the Bruneval Raid, the Gibraltar barrage, radar, Window, heavy water, and the German nightfighters" (R.V. Jones). Other WWII technology & warfare efforts included the branch's V-1 and V-2 Intelligence activities. Search and download Air Ministry Combat Reports, 1939-1945 from The National Archives. ↑ British Military Aviation in 1916, RAF Museum. Retrieved on 19 January 2007. ↑ Boyle, Andrew (1962). "Chapter 8". Trenchard Man of Vision. St. James's Place London: Collins. p. 173. ↑ Baker, Anne (2003). From Biplane to Spitfire. Pen And Sword Books. p. 109. ISBN 0-85052-980-8. ↑ Joubert de la Ferté, Philip (1955). The Third Service. London: Thames and Hudson. p. 61. ↑ The organisation and function of the War Office, The Long, Long Trail - The British Army in the Great War of 1914-1918. Retrieved on 19 January 2007. ↑ "Copy of Patents for the invention of radar" (in French). radar-france.fr. ↑ Jones, R. V. (1978). Most Secret War: British Scientific Intelligence 1939-1945. London: Hamish Hamilton. pp. 335, 437. ISBN 0-241-89746-7.